What do wild symbols do? Wilds are multi-faceted pokies features that can substitute for other symbols to create big-paying combinations. But that’s not all they can do, so read on to find out exactly how wild symbols work and where you can take advantage of these tasty features when playing real cash pokies online. Our recommended Internet casinos carry hundreds of A-grade slot games that are bursting with wilds, scatters, free spins, and many more exciting features. We at Pokies Game Australia use these sites ourselves when we play AUD slot games on the Net, which is why we can confidently say they are among the safest, fairest, and most reliable real money gambling websites going around. Look no further than the eCOGRA Seal of Approval, which is only awarded to fully certified Web casinos with water-tight SSL (Secure Socket Layer) encryptions for safe AUD banking and fail-safe RNG (random number generator) programs for 100% honest online gaming. Royal Vegas Casino is our top-rated online slots site for Australians, with over 400 virtual poker machines and up to AUD $1200 free money on offer when you sign up for real cash gambling. Check out our other trusted digital casinos in the table above for more great pokie titles and generous AUD bonuses. What is a wild symbol? A wild is a panel that can act as whatever symbol you need to create the best possible winning combo. It operates much like the Joker in traditional card games, or like the wild cards in video poker variants such as Deuces Wild. The only symbol a wild cannot mimic is the scatter feature. For example: let’s say we are playing the Wheel of Wealth three-reel slot game, and our spin turns up Bar-Bar-Wild on the top payline. Because the wild (in this case, the Wheel of Wealth logo) can substitute for any other symbol, this completes the Bar-Bar-Bar combination for a win. In five-reel pokies, the wild feature can turn already tidy payouts into gigantic windfalls. For instance, say we have a line of Crown-Crown-Crown-Wild in Avalon. Three Crowns pays out a respectable 20 credits; but with the wild Avalon symbol on the end, we get four Crowns for a much more hefty return of 100. Wilds can also form the missing link in the chain, thus creating a paying combination where there was none before. For example: if we were playing Break Da Bank Again and drew Sapphire symbols on reels one, three and four, we would win nothing – unless there was a wild on the second reel, which would make it four Sapphires for a collect of 150 coins. Wilds can look like anything. Commonly, they are represented by the game’s title logo, but they can also take the shape of something central to the game’s theme – such as the Thor’s Hammer symbol in the original Thunderstruck pokie. To find out what a wild looks like in any given Web pokie, click/tap the ‘View Payouts’ option to read the descriptions for each feature. Pokies wilds can take on a number of extra traits that allow them to do much more than just fill out a winning sequence. The most common example of this is the wild multiplier. With this feature, any paying combination that includes a wild symbol will get you at least double the standard payout. To demonstrate, let’s say we are playing Agent Jane Blonde. Normally, five Lipstick symbols pays 125 coins. However, if one of those panels is replaced by the wild (a close-up of a windswept Jane Blonde, pictured right), the spin will pay 250 coins. This is a classic example of a 2x wild multiplier. Wild pokie multipliers can come in many denominations, from 2x and 3x symbols up to as high as 10x. And like scatter multipliers, they can also be exponential – i.e. the more wilds in the combo, the bigger the multiplier. For example: we hit a $50 winner with one wild as a 2x multiplier, which gets us a $100 payout. If we get the same hand but with two wilds involved, they then combine to become a 4x multiplier for a return of $200. In some online feature pokies, the wild symbols will be clumped together in consecutive spots on the reels. These are called stacked wilds. They usually come in groups of three, although stacks of four or five wild panels are not unheard of. The Wolf Run slot game offers an excellent demonstration of the stacked wild feature. In a typical three-symbol stack, you might land only the top-most or bottom-most wild. If you are lucky, you might see two or even all three come up at once. This gives you the chance to put together wild combinations across several different paylines – which is especially tasty if the wilds are also multipliers. A cool variation on the stacked wilds format is the expanding wild symbol, as found in many recent releases. Here, instead of several wilds piled on top of each other, the wild spots are isolated like any other symbol. However, when an expanding wild comes up on any given spin, it pushes out all the other panels and covers the entire reel. 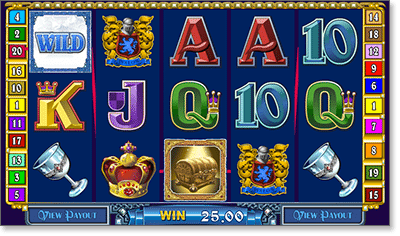 This can be extremely profitable on real cash pokie machines that have four or five rows and wild multipliers. Whether you want to play for free or get straight into the real money pokies action, our recommended Australian online casinos offer the best Internet slots around. Enjoy featured-packed digital pokie games with wild multipliers aplenty, including hundreds of acclaimed releases by Microgaming – the world’s number one developer of Web-based casino gaming software. Sign up at Royal Vegas Casino to indulge in over 400 rich feature pokies and snare up to AUD $1200 in free casino bonuses.